Eliphalet Haskell was b. 3 Jun 1753 in Gloucester, Essex County, Massachusetts, d. 7 Nov 1833 in New Gloucester, Cumberland County, Maine. Eliphalet is my 4th great-grandfather. Transcription: ELIPHALET HASKELL/DIED/Nov. 7, 1833/AEt. 80. Ancestral Chart No. 16, continuing Merrill Haskell's direct family line, compiled by Grace Ware (Holbrook) Haskell's. Chart 16 continues from Chart 1 with Eliphalet Haskell back to William Haskell who was born circa 1617 in Charlton-Musgrove, Somerset, England. It appears that William and his older brother Roger, younger brother Mark, and younger sister Joan sailed for American circa 1635. They landed at Salem in Massachusetts and settled in Cape Ann (Beverly and Gloucester). 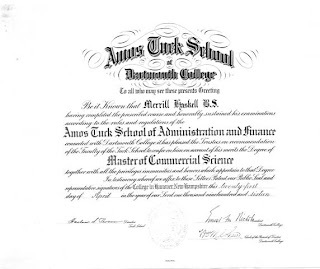 After receiving his BS degree, Merrill Haskell continued on and received his Master of Commercial Science Degree at the Amos Tuck School of Administration and Finance (at Dartmouth College) on 21 April 1916. Here is an image of his diploma. The first afternoon Dr. Grace Burnett examined the girls who had not brought certificates. Later, a few went in swimming, the rest watching and waiting, to see the effects; some were not allowed to swim, but others were sceptical [sic] owing to reports of the "dangerous pond." A twenty-five-foot portion being roped off to prevent the possibility of going out over one's depth, and someone of responsibility always being on hand at the swimming hour proved enough, and soon all those who could, were longing to learn to swim and never missed a day. The first day acquaintance was not easy, for many of the girls never having been out of their homes were naturally shy with so many strangers about. Their first night's experience at sleeping out caused them to be up or at least wide awake at dawn. each proceeding night their sleep improved till in three or four days they slept soundly till the rising bell sounded at six o'clock. First of all with bloomers over their nightgowns, they had calesthenics [sic] in the barn with Helen Bradley. Each day a certain number were portioned to a duty, & four girls set the tables for the day, and helped the cook with the food preparation. Breakfasts were of cereal, fruit sometimes, and eggs, also cocoa and bread. Inspection at nine oclock of all the tents meant that everything should be neat - no str**gs etc on the ground, bags and shoes under the beds, and all else out of sight with the exception of a small piece of oilcloth on which were laid each each person had on her bed with her toothbrush and comb and brush. Charlotte B. Haskell was b. 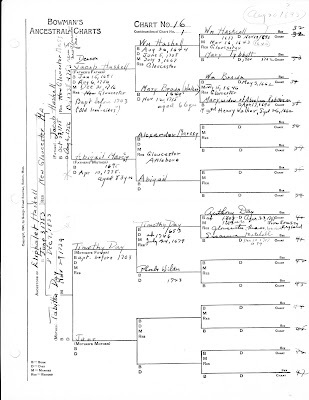 5 July 1819, New Gloucester, Cumberland County, Maine, daughter of my great-great-great-grandparents, Amos and Sarah "Sally" (Johnson) Haskell. She made this cross stitch sampler circa 1830, when she was 11 years old. The original sampler is now at my Dad's house and is in excellent condition. Alfred Haskell died August 29th A.D. 1816 Aged 3 yea. Wrought by Charlotte B.Haskell Aged 11 years. 1830.
as the first efforts of an infants hand. Prepare her tender heart to feel thy love. And write thy name thyself upon her heart. To share the sweets of blest redeeming love. 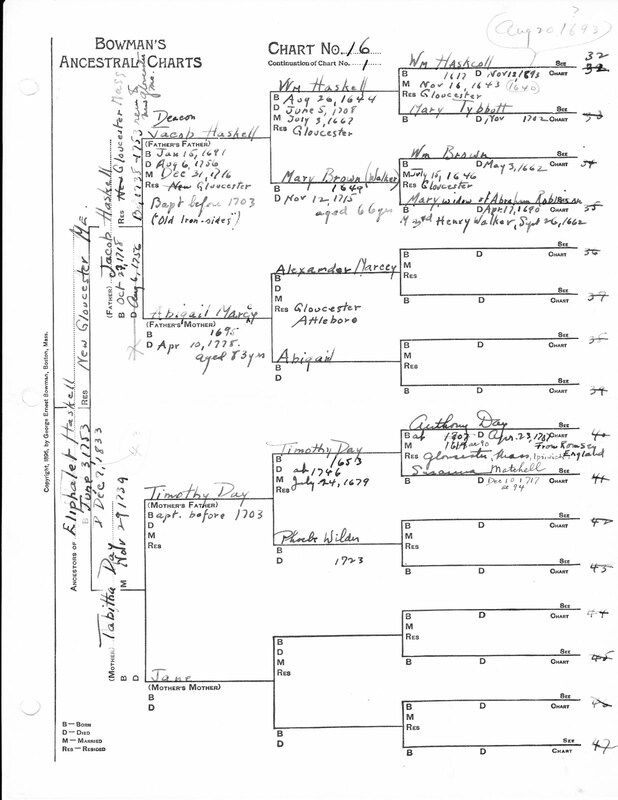 My grandmother's (Grace Ware (Holbrook) Haskell) genealogy research includes several binders of notes, ancestral charts and other family history information. Here is one of her ancestral charts documenting five generations starting with my grandfather. I am in the process of documenting the data that she gathered and providing sources for her research. The numbers on the far right of the page correspond with the next chart in the series going back in time. 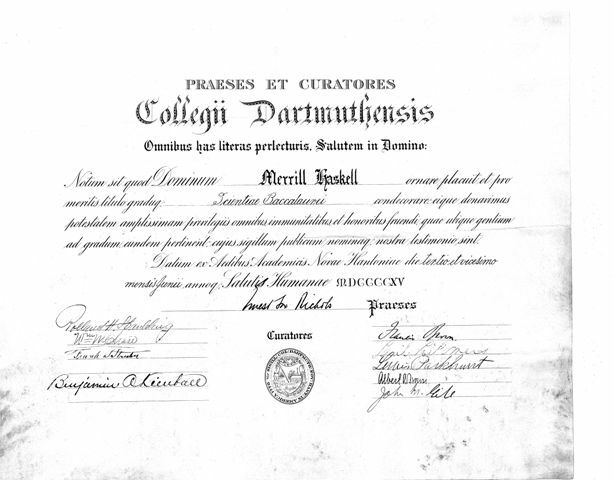 Merrill Haskell graduated from Dartmouth College with a Baccalaureate of Science Degree in 1915. My Dad recently found a copy of his diploma while cleaning out some old files at home. Now this is backpacking in style! 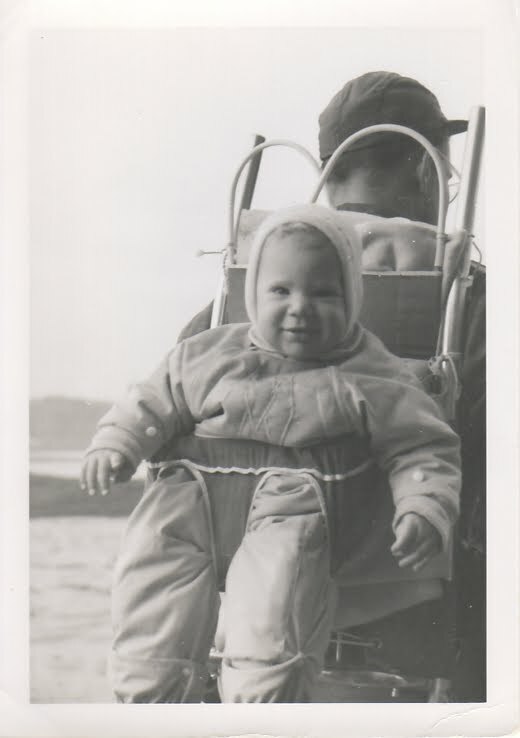 That would be me being carried on my Dad's pack frame. We did a lot of hiking when I was growing up. Not sure I enjoyed every trip, but I certainly learned to enjoy it as I got older. I remember many trips to Evans Notch and Grafton Notch in the White Mountains and trips to Baxter State Park in Maine. The hiking gene seems to be missing in my teenage son, but hopefully he finds it again as he gets older. While in high school, my Dad and I took an annual summer trip to Baxter State Park to hike and fish. We spent time at Wassataquoik Stream, Russell Pond and Wassataquoik Lake. In 2007 my wife, son and I hiked the 7 miles in to Russell Pond from Roaring Brook Campground and had a great time. Here are some of my favorite photos of that trip. My grandmother, Grace Ware (Holbrook) Haskell kept a book of dates from 1926 to 1945. Her entries were quite regular at times and sporadic at other times. I plan on posting her entries as a regular part of my blog. Some of the handwritten entries are very hard to decipher, but I will do my best. 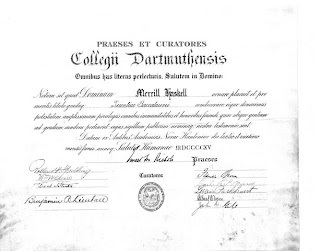 At the start of 1926, a year before she married my grandfather, Merrill Haskell, it appears that Grace was in France and Italy. The house we occupied as headquarters stands up from the water's edge in an open space about two hundred feet, overlooking all the pond. Beyond the house is the barn a fairly large one with good upper loft. Below the barn is the little clapboarded house we used as kitchen, and in front of this we pitched our fly as shelter for the dining tables. Across the open space about one hundred feet from the kitchen we pitched the tents in which we all slept with the exception of our camp cook and camp advisor who slept on the porch of the house. The sixteenth of July then a number of us motored to the top of Ames Hill loaded with every possible article imaginable in the way of food, bedding, tents, clothing, etc. Helen Bradley, Mr. Daudelin and myself were of the first to settle down, then with the help of Mr. Dorr Bradley and his daughters, and Mr. Cook we put up tents and began to put up tents. On the eighteenth we all congregated: - Mr. Bradley drove some girls in his car, then Mr. Cook and I also filled our cars with all kinds of things and took more girls, mostly from Vernon. At the same time Mr. Moffitt and Sarah and Helen Bradley went to West Halifax to bring that group of girls to camp. In all there are seventeen girls received that day, and we lunched on sandwiches and milk prepared for us by Miss Sutherland - camp cook - and Miss Lesley. My grandfather, Merrill Haskell was b 6 Feb 1892 in Portland, Cumberland County, Maine. In this photo with his mother, Clarissa Hollingsworth (Merrill) Haskell, he is 8 months old.